We have to start this review saying that mistery is the brand of the monocular, nothing misterious about it. The monocular is made of rubber with glass coated lenses, there are two rings as controls. One of the rings controls the monocular focus and the other controls the magnification factor from 7 to 14 times. The image quality is good and the focus is easy to set, the bigger the magnification factor the more narrow the area where you can obtain focus in 7x the image is clear and the details can be observed very well in 14x the image is still clear but not as clear as in optical instruments of higher quality. The lenses are fine but do not capture enough light for the diameter they have, probably due to a suboptimal coating or the lens construction itself, this means that the monocular won't operate very well in dark environments and won't be able to pick many details after sunset. 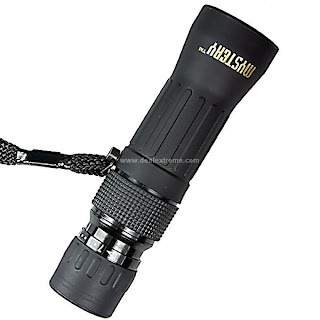 The monocular is 5.5 inches long, slightly bigger than the regular pocket monoculars but this one is zoomable and the others are not so the extra size is easy to explain. The construction is solid and the monocular seems to be well made for its price. A good product that works well in both 7x and 14x but don't expect extraordinary images. You can order for $17 from DealExtreme. The All-Ett is a very special wallet designed to be very light and very small, according to the company a normal wallet can be up to 16 times bigger than the All-Ett Wallet with the same content inside. The "original" model has 4 pockets for cards, two pockets for bills and one extra deep pocket for things such as receipts, airline tickets and others. Among other versions we can highlight the european version with just 2 pockets for cards and the travelers version with space for your passport, ticket, and money. The All-Ett is made of a very thin nylon material called "spinnaker cloth", it is thin as paper but very strong, and that explains why after loading the wallet with 10 credit cards the wallet is as big as the 10 cards are without almost any extra volume due to the wallet itself. The material is also washeable and water resistant and it doesn't get bad in the humid summer days. 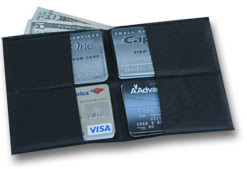 The slim approach of the All-Ett wallet multiply the options to carry, you can use it in your front pocket or back pocket and is hard to notice it is there. For those looking for a wallet with basic features but as thin as paper and very light the All-Ett is certainly a terrific product. You can read more, see the different versions and order for about $20 from the official website.